When I was fourteen, after a long absence from South Korea, I spent the summer in Seoul. It was 1974. Soon enough, I was bored out of my mind-I had rapidly read the books I had brought with me, and there wasn't much of interest on television or in movie theaters.1 My maternal uncle took pity on me. He shepherded me through the hot spots of Myŏng-dong, at that time easily the most fashionable district in the country, the Gangnam of its day, when Gangnam itself was largely a swamp. But Myŏng-dong's narrow streets hardly screamed fashion or sophistication. The principal respite from dodging aggressive peddlers and ambling among uniformed students was a repast at some hole-in-the-wall eatery, or a visit to a depressingly dark teahouse that had dour servers to boot. I was momentarily amused by ice cream served on dry ice at the Savoy Hotel, but my smile lasted about as long as that artificial fog. Somehow my uncle figured out that I was interested in music, and he took me to a variety of age-inappropriate shows. If miasmic memory serves, I saw Patti Kim, then the queen of South Korean popular music, and the crooner Kim Chŏng-ho, among others. We even went to the legendary venue C'est Si Bon. My uncle proudly pointed out that Patti Kim had performed in the United States. Now, almost four decades later, nearly everything has changed, as a recent visit to South Korea confirmed. I saw that Myŏng-dong's massive face-lift had left behind very little of that district's fabled (some say sordid) past. The Savoy Hotel still stood, refurbished to be sure, but was no longer fancy or fashionable, its past glory having long since evaporated like so much dry ice. School uniforms and standard haircuts had been superseded by blue jeans and short skirts and a wide array of hairstyles and hair colors. Glowing cafés had replaced the district's dim teahouses-the servers smiled now-and fast-food chains jostled with upscale restaurants. But amidst this welter of change, itself a cliché of South Korean life, there were few things more striking than the transformation of the soundscape.2 Upbeat tempi and bright timbres had silenced the melancholic melodies that used to waft, along with clouds of cigarette smoke, through Myŏng-dong's teahouses and watering holes. But the most vibrant difference was the sound of American-style popular music, once strange to South Korean ears and now dominating television shows and, it seemed, every other screen. And now it was no longer my uncle or my cousins but non-Koreans who apprised me of the ins and outs of South Korean popular music, showing me the latest music videos on their phones or tablets. Forty years ago, an astute analyst might have anticipated the rise of South Korea as a manufacturing power, but I doubt that anyone would or could have had any inkling of the age of K-pop. Girls' Generation and Super Junior, SHINee and 2NE1, SISTAR and T-ara, 2PM and 2AM, BIGBANG and BEAST (B2ST)-these artists have become not just stars in South Korea but pan-Asian, even global sensations. The viral explosion of "Gangnam Style" in 2012 refuted the canard that South Korean popular music would never make it in the United States.3 And if imitation is the sincerest gauge of popularity, then the proliferation of copycat videos suggests that something is indeed afoot. So what happened? Nothing comes out of nowhere. A series of breaks does separate the past of Korean music from the K-pop present, and of course our biographies and histories are replete with shifts and changes. But K-pop represents something else-nothing short of a revolution, and by no means the only one in the shifting soundscape of the Korean peninsula. The future, as we know, is notoriously difficult to envision. What may be even more challenging is to see the past, that proverbial foreign country, as it really was. In the following section, to make sense of the K-pop phenomenon, I explore the Korean musical past, not in order to endow K-pop with a proud genealogy but rather to reveal its birth as both belated and unrelated to the lineage of Korean music. It would be easy to exaggerate the distinction between the two main modalities of music. Whereas court musicians made refinements to musical instruments and developed elaborate notations (chŏngganbo), the nonelites played received instruments without any systematic musicological apparatus. From a musical standpoint, it is possible to suggest some tendencies and tentative generalizations: elite music featured slower tempi, longer tones, regular rhythms, and syllabic notes in contrast to the faster, shorter, irregular, melismatic characteristics of its populist counterparts. Yet these sharp contrasts obscure exception after exception. Furthermore, the binary distinction between elite and popular reduces the considerable complexity within each category as well as the interactions between them. Kasa, a genre of vocal music, was an interstitial form, and p'ansori encroached on the world of elite music. Kisaeng (courtesans) performed popular genres for the court and the literati.14 Different religious and spiritual traditions, including Buddhist and shamanist, engaged in musical practices distinct from both chŏngak and minyo and traversed the social divides of Korean life.15 Regional diversity remained stubbornly strong.16 The distinctions between elite and people's music rested less on strictly musical divergences than on the social positions of listeners and performers, positions embedded in the rigid social hierarchy of Chosŏn Korea. Given our distance from the Chosŏn soundscape, it is easy to accentuate not only the correspondence between the social organization of status and that of sound but also the functional role of music in social life.17 Yet the sociological emphasis, much as we wish to avoid the besetting sins of reductionism and determinism, would be far preferable to an emphasis on ethnocentric musicology. For contemporary listeners, Korean or non-Korean, the commonalities of kugak are readily apparent: even those who have never consciously listened to a single note of traditional Korean music believe that they can identify it. The reason is that kugak is a strange and alien aural universe for most contemporary South Koreans. The introduction of the Western soundscape revealed the shared soundscape of Chosŏn Korea and in turn spawned the enormous condescension of the Westernized present, which reduces the considerable diversity of traditional Korean music to a simple and residual category called kugak. Symptomatic of this problem is the fact that the South Korean term for "music," ŭmak, is basically synonymous with the term yangak, "Western music. "26 Confucian ritual music and the Confucian social order faded together, just as nongak disappeared with the decline of agrarian life. Traditional Korean music represents a strange soundscape for contemporary South Koreans, for whom rhythm and blues (R &amp B) and reggae, bel canto opera and piano sonatas, are integral parts of South Korean life. In contrast, kugak is an imaginary museum, and one rarely visited at that. The desire to showcase traditional and distinctive Korean culture to the outside world generates the intermittent demand for kugak, though it is performed just about as rarely as the Olympic Games take place.27 To be sure, there are recurrent reports of the revival of kugak. Minsok ŭmak had long been consigned to oblivion in South Korea, but the people's (minjung) movement, which fueled the anti-government, pro-democracy politics of the 1970s and 1980s, revived it-especially in the form of samul nori, a derivative and stylized genre of nongak-precisely when people's music had been almost completely expunged from the countryside.28 It constitutes something of a revenge of the people that the most popular genres of kugak, such as p'ansori and sanjo (scattered melodies), stem from demotic roots. Yet almost inevitably these genres are modernized to render kugak palatable to the contemporary musical competence and tastes of South Koreans steeped in the Western soundscape.29 In contrast to Japan, where a refined upbringing has entailed instruction (almost exclusively for daughters) in traditional Japanese instruments, such as the koto, similarly aspiring South Korean parents have rarely enjoined their daughters to take up traditional Korean instruments but instead have steered them toward Western piano and violin. For almost all South Koreans, comprehending the beauty of a kugak performance-its tonal colors, its melodic intensity, its raspy articulation, and much more-is as elusive as apprehending the aesthetics of Venda songs or Gregorian chant. The late Chosŏn regime was resistant to non-Chinese influences, and vast expanses of the countryside remained impervious to any undertone of a massive Western march. External encroachment rode roughshod over the levee that had been erected against barbarian incursion. The 1876 Treaty of Kanghwa was merely the first in a series of unequal agreements that would ultimately undermine Chosŏn Korea. Japan, rapidly Westernizing, was the primary power over the Korean peninsula after Japan's military victories over two competing regional powers, China (1894-1895) and Russia (1904-1905). Beginning in 1905, Japan ruled the Korean polity as a protectorate, annexing it outright in 1910. Henceforth, Japan controlled the major levers of politics, economics, and culture. The general trend of colonial rule was assimilation, at once expunging things Korean and implanting things Japanese, from language to personal names, and the world of music was no exception. The crucial caveat, however, is that it was not traditional Japan that Japanese colonial rule institutionalized; instead, it was modern Japan, an amalgam of influences, though these were preponderantly Western in form and content. In the world of elite music, Japan did not impose gagaku (the Japanese rendition of classical Chinese-influenced court music) but rather European art music.32 And the imposition was hardly unilateral: in 1900, Korean royals hired Franz Eckert, a German, to form the Imperial Military Band, and a year later-even before Western brass bands arrived in Japan-a brass band of just that kind performed in Seoul.33 Eckert, the composer of the Japanese national anthem, or at least of its harmony, also composed the first Korean national anthem.34 It may seem curious that the Japanese and Korean elites, in the absence of explicit external pressure, would independently capitulate on an ostensibly cultural matter, and this is especially the case for Korean royalty, which remained resistant to non-Chinese influences. But music, especially Western military and ceremonial music, was perceived as part and parcel of Western military and technological might.35 That is, the Japanese and Korean elites considered music as belonging more to cultural technology than to traditional culture. Already by the 1870s, Japanese educational bureaucrats had introduced Western music education into the Japanese archipelago.36 Western choral music was not only a mark of modernization-useful for catching up with and, ultimately, overtaking the West-but also a means of shaping ethical, loyal subjects.37 The musical gulf between the elite and the masses would be bridged, it was believed, by Western notes and measures. And when Japan colonized Korea, Japan also brought its educational curriculum, including Western music education. Organ playing and choral singing now became essential elements of Korean schooling.38 Western music instruction was supplemented by the dissemination of Western folk tunes and children's songs.39 In brief, the Korean and Japanese elites were united in embracing the music of the West-that technologically and (in a more ambivalent sense) socially superior power-and in so doing they neglected, even castigated, their received music. Kugak, in response, adapted to the Western culture of music. In the 1900s, for example, p'ansori, although it remained a distinct genre, gave rise to ch'anggŭk (choral theater), and thus to musical theater or opera.40 The expanding aural hegemony of the West is the basso ostinato of the twentieth-century Northeast Asian soundscape. Nevertheless, it would be a gross exaggeration to say that the Western music education insisted on and imposed by Japanese (and Korean) educational bureaucrats transformed every Korean (or Japanese) citizen into an aficionado of European classical music. Far from it-Western-style formal education remained largely the province of the affluent. And for at least half a century, two distinct musical cultures reigned in Japan and Korea: top-down, government-imposed Western music, and bottom-up, traditional and diverse native music. European music, whether in its simple articulation as a military march or its elaborated development as a bel canto aria, struck most Northeast Asian listeners, at least initially, as repulsive and bizarre, though for some it was beguiling and bewitching.41 In any case, a new generation was instructed in the European soundscape, and when that generation came of age-a development that, coincidentally, was coeval with urbanization and the other social changes that we usually summarize with the term "modernization"-one precondition of Western-inflected popular music was achieved: there were now people who were attuned to the new soundscape, people who were acquainted with and acquiring a new musical competence.42 Western-inflected popular music would thereafter supersede not only elite European music but also native music. To repeat, it is kugak that would become marginal on the Korean peninsula, as strange as European music had been to Koreans in the early twentieth century. What became normative was popular music. Similar complaints are found throughout the literature of popular-music criticism. In this struggle, as Gustav Mahler reputedly declared, "the younger generation is always right. "62 The urge to seize the moment valorizes the present and the new, contributing in turn to the devaluation of the past and the traditional, which in any case is suspicious precisely because of its association with parents and elders.63 The perpetual modernity of the popular-music canon goes hand in hand with a constant forgetting of the past.64 Youth's discretionary spending power and the constant transition of the generations ensure that popular music beats on, borne ceaselessly into the future. Certain conditions, then, pave the way for popular music. The industrial-technological revolution and the urban consumer revolution (or the expansion in the number of people who can consume music, either in performance or by means of its technological reproducibility) constitute the sine qua non of popular music. By the mid-1920s, the rudiments and many of the essential preconditions of popular music were already present in Korea. Therefore, despite the oft-rehearsed claim (heard most commonly among ethnic Koreans themselves) that Korea was behind the West and Japan, at least in the realm of popular music that time lag was truncated. Educated Koreans, whether schooled in Confucian academies or trained in Western-style universities in Japan or elsewhere, largely reproduced the received status hierarchy and its prejudices during the colonial period. Folk songs were nothing more than vulgar peasant songs; the itinerant entertainers known as kwangdae were coterminous with beggars and streetwalkers. As much as Confucius lauded music, the Confucius-drenched yangban performed or listened to a particular style of formal and refined music, dismissing as almost inhuman the wailings and noises of unrefined peasants (no matter how much the yangban themselves may have enjoyed the same vulgar music, although performed in a more refined manner and in sophisticated settings, in the company of courtesans). Therefore, as Japanese rule entrenched itself, the yangban increasingly listened to what the educated Japanese professed to like. Nonelite folk music and farmers' music were stubbornly rooted not only in the countryside but also in particular villages; local variations and regional diversity rendered them not so much a music of solidarity as a music of differentiation.66 The canonical form of folk song, transposed to a modern musical idiom, occludes regional diversity. The indisputable national folk song of South (and North) Korea is "Arirang," but there were and are numerous regional variants.67 In fact, "Arirang" was originally regarded as a relatively new song, and it achieved national status only after its adoption as a theme song in the popular 1926 film Arirang; thereafter, it was canonized and disseminated in European musical notations, and it was usually performed with European instruments.68 Paradoxically, from the contemporary nationalist perspective, it was not the Korean elite but the Japanese colonial government that promoted the collection of Korean folktales and folk songs.69 But Korean folk music was already in decline by the time Japanese and Korean scholars began to scurry in search of it.70 The massive rural exodus that convulsed the peninsula for the entirety of the twentieth century dispersed ethnic Koreans not just across the Korean peninsula but well beyond it. K-Pop: Popular Music, Cultural Amnesia, and Economic Innovation in South Korea seeks at once to describe and explain the emergence of export-oriented South Korean popular music and to make sense of larger South Korean economic and cultural transformations. John Lie provides not only a history of South Korean popular music—the premodern background, Japanese colonial influence, post-Liberation American impact, and recent globalization—but also a description of K-pop as a system of economic innovation and cultural production. In doing so, he delves into the broader background of South Korea in this wonderfully informed history and analysis of a pop culture phenomenon sweeping the globe. 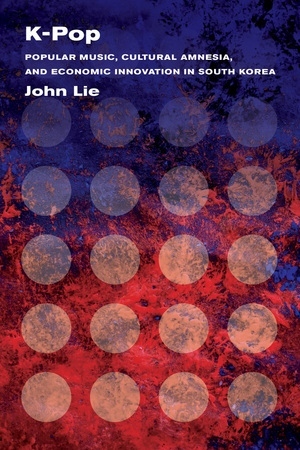 John Lie teaches social theory at the University of California, Berkeley.